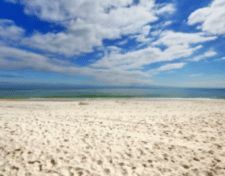 Orange Beach Alabama gulf-front condo for sale at Phoenix Orange Beach II. Customize this lower level beachfront property with 1,60+/- sq. ft. – the building is currently under construction, and you can choose the cabinets, counter-tops, floor-covering and paint colors. Designed to be a an excellent rental home, the open floor-plan allows for two queen-beds in each of the back bedrooms and boasts a gulf front master bedroom. The large private balcony has amazing views of the white-sand beaches, the Gulf of Mexico and the Perdido Pass – come see this incredible condominium. Phoenix Orange Beach I-II gulf-front condominiums are situated on the white-sandy shores of the Alabama Gulf Coast, these gulf-front properties are the latest Phoenix developments, offering beachfront condominium homes offering incredible views of the white-sand beaches on the Gulf of Mexico. These resort properties consists of 3 & 4 BR residences – community amenities include a beachfront pool, an exercise facility, covered parking, beach boardwalk, indoor pool and more.